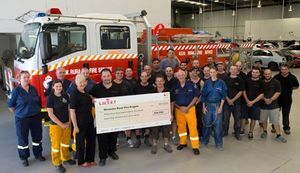 Money raised by Capital S.M.A.R.T will ensure the delivery of a new fire truck for the Winmalee Rural Fire Service in New South Wales and help protect the local community in the future. Winmalee was devastated by fire last October when 193 properties were destroyed, and 109 damaged. It was however close and personal with a team member from Capital S.M.A.R.T Seven Hills centre losing his house and all his family’s personal possessions. Nationally, an overwhelming number of S.M.A.R.T colleagues expressed their desire to help, and as a result a fundraising campaign was held, which elicited personal contributions from individuals, and from the company which donated money for cars repaired in the week following the fires. Capital S.M.A.R.T Chief Executive, Norman Moss said he was very proud of the number of S.M.A.R.T Team Members who expressed their desire to help. “The new fire truck is crucially important to Winmalee’s ongoing fire fighting efforts. The Brigade was offered a new fire truck through a U.S. company but one of conditions was contributing to the cost. The Capital S.M.A.R.T donation has allowed the Brigade to achieve the nominated figure.” “Our people were concerned about the impact on both our colleague, his family and the entire Winmalee area and wanted to do something to help, and playing an active role in local communities is very much part of the culture that we have built at Capital S.M.A.R.T,” Mr Moss said. Mr Moss thanked all Capital S.M.A.R.T team members who contributed to this fundraising initiative. Winmalee Fire Brigade crew with President, Ken Wade-Ferrell attended an event at the Capital S.M.A.R.T Seven Hills centre where the cheque for $54,750 was presented.